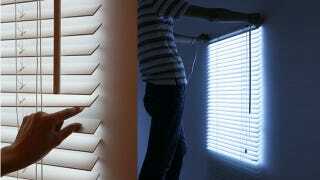 With Blinds Like These, Who Needs Windows? Winter's quickly approaching and that subterranean studio apartment of yours won't be getting brighter any time soon. So, instead of knocking out walls for an impromptu Sun room, just fake it with these illuminated faux-shades. Designed by Makoto Hirahara, Bright Blinds are constructed from electroluminescent sheets and controlled just like conventional window treatments. Tug on the cords to turn them on and adjust the brightness with the plastic twisty-wand. Just make sure your cat doesn't try use one as an escape route.